All the articles, related to three externally touching circles, have been derived by using simple geometry & trigonometry to calculate inscribed & circumscribed radii. 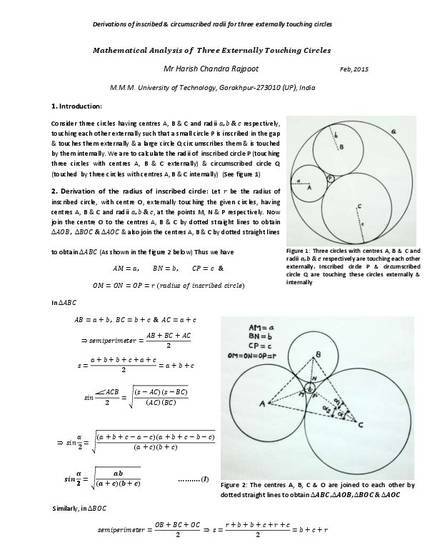 All the articles (formula) are very practical & simple to apply in case studies & practical applications of three externally touching circles in 2-D Geometry. Although these results are also valid in case of three spheres touching one another externally in 3-D geometry. These formula are also used for calculating any of three radii if rest two are known & the dimensions of the rectangle enclosing thee externally touching circles. Here is also the derivation of a general formula for computing the length of common chord , area of intersection and angle of intersection of two intersecting circles.